Kids have wild imaginations. That’s one of the many things I love about them. Do you remember any magical moments from your childhood? Theresa Milstein shared a wonderful memory with me: When I was about 4-years-old, I remember listening to the radio and not understanding where the sound came from. I asked my aunt how it worked. She told me there was a man in the radio. I was skeptical. “But how does he do all the voices?” I asked. 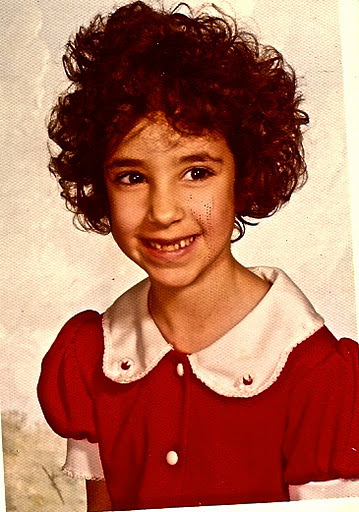 Little Theresa at age 6 – what a cutie! I didn’t know whether or not to believe her. For some time afterwards, I’d bring my ear close to the speaker to see if I could hear that it sounded like a man really lived in the radio. I could picture all his furniture inside, like the radio was a miniature house for the little man. I was an idiot. No way were you an idiot, Theresa. You were a darling little girl with a great imagination. I’m not a parent but an auntie and the sweetest memory I have of my nephews growing up is this: My nephews were 6 and 4 years old. They came to visit me and my disabled sister. She used a stairlift back then and the boys were fascinated by this chair that went up and down along the staircase. When they asked me how this happened, I said “Little people as small as your little fingers live under the chair and push it up and down”. They spent the whole visit peering under the stairlift chair and I felt most mean! Isn’t that a hoot? It goes perfectly with Theresa’s story. This entry was posted in Humor, Parenting Plights and Delights and tagged Uncategorized. Bookmark the permalink. Little Theresa is so cute. And now I can't get the image of a little man and house inside a radio. Miranda – I agree that little Theresa is so cute, and she didn't think so, but she definitely was a darling little girl.Tracy Jo – I'm so glad you enjoyed Theresa and OK's stories. Thanks for stopping by and commenting.Joshua – LOL! Maybe you'll come up with a good story with the little man as your MC! Old Kitty – Thank you for sharing your fun story. And now that you have a niece, too, I'm hoping you'll have more to share with us in the future! I'm blushing. Thanks for having me!Old Kitty, you remind me of my aunt! I can picture those boys looking for those little people. Want to know what's so funny? Old Kitty and I are in the 100 Stories for Queensland anthology together and we're going to be in flash fiction anthology this year. Now we're both featured in this post. Maybe we should write a book together. I shared this on Facebook. Hope you get some traffic. Oh my gosh! I love Theresa & Old Kitty's stories. I remember when I was young my Great Aunt told me there were fairies in her garden. I went looking and was so disappointed I couldn't find any. Then she pointed them out to me and I got super excited that fairies were real. I later discovered they were dandilion seeds floating in the air. Once when I was a teenager, my aunt asked my mother for tips on how to break her daughter from the pacifier. My mother proceeded to tell the story of how she broke ME from the pacifier. "I took it away from Dianne, told her it was time to say good-bye, went into the bathroom and flushed the toilet. I put the pacifier in my pocket. Dianne watched the water go down, and never asked for her pacifier again. "I (the teenage me) jumped up and exclaimed: "You mean you didn't flush it?! "Up to that day, I'd had no real memory of the incident, but if anyone had asked me what happened to my pacifier when I was a toddler, I would have automatically said, "Mom flushed it." I didn't realize how thoroughly entrenched that idea was until I heard her side of the story! Theresa is so cute! What a fun topic. My uncle told me that eating black watermelon seeds will make a watermelon grow in my stomach. And at meals my grandpa told me that every time my elbow bent, my mouth flew open. It's true!And recently my oldest son's friend gave my little twins these really cool night lights. My twins were afraid of spiders (they still are), so he told them these lights are made to keep spiders away. It still works! Theresa – Wow, that's quite a coincidence that you and Old Kitty have both been published in the same anthologies and then had similar stories for my parenting stories! Susan – Thank you! So glad you stopped by. I know you've got a million irons in the fire right now!LTM – I think I would have been looking for the little people and the little man, too. I was a pretty gullible kid. Still am! That's funny that your hubby pushes your daughter's buttons about the donkey dream. What a wild dream! He better watch out cuz one of these days she's going to come up with something just as crazy to kid him about, something that won't amuse him! Payback!Dianne – That was a pretty good strategy that your mom used to do away with the pacifier! And how funny that you didn't know what really happened until you were a teen! 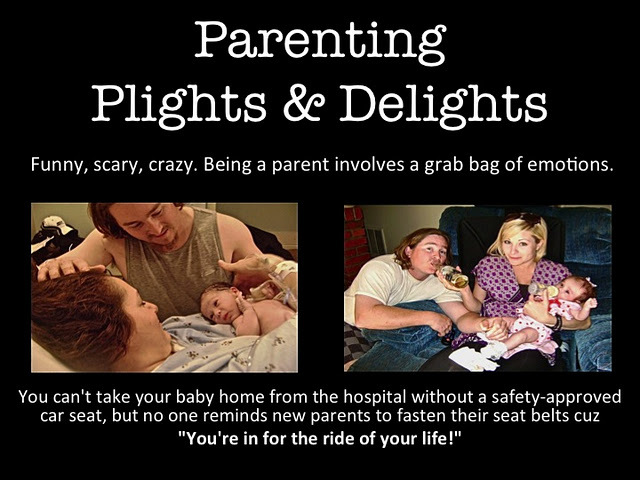 I love the things parents think up to deal with those annoying little child rearing problems! Julie – So nice to see you again. And those are great stories. I love the one about bending your elbow and your mouth flying open! LOL! And your son's friend who gave your twins those nightlights that they believe keep spiders away, how cool is that? Thanks for sharing these stories.Jeremy – Aw, thank you! Whenever there was kissing scene on tv, my Mom would tell me they were whispering to each other, and it kept me wondering which of the two was doing the listening. Too funny! I was one of those gullible kids. My grandmother and grandfather brought me with them to visit a distant relative. They lived on a farm in the countryside outside of Milwaukee. One of the older ladies there that day told me that the frogs came when they where called. I yelled, "Here froggy froggy," until my grandmother came outside and told me to stop. Hahaha! Dang. I believed that if I had another five minutes, one of them would have hopped right up to me! I love that school photo–so sweet! Lynn, you're getting enough material for a series! The story about the radio (and the stairlift) makes me think of The Color of Magic by Terry Pratchett. 🙂 There's a gremlin (I believe it's a gremlin) who lives and operates the camera Twoflower, one the main characters, uses. Oceangirl – That's really funny! I love it. thank you for sharing that with us! Catherine – I know, wasn't Theresa a darling little girl? I can just picture her trying to listen to the radio for the little man!Susie – That's such a cute story! LOL! I'm so glad you shared it. Sounds like a scene from a picture book!Coleen – I love that photo, too! Thanks for stopping by.Theresa – I know! These are great stories being shared in the comments! Woo hoo! Thanks for sharing this post on your FB page!Eagle – I haven't read that one, but I love the title. Sounds really good!Angela – Thanks so much! I'm so glad you're enjoying my series! I get the biggest kick out of everyone's stories! Sarah – You're right, that does look like an Annie dress! Cool!Nutschell – Thank you! I hadn't heard of the Write On to Build On group yet. I'm glad you enjoyed seeing Theresa's pic and reading her story. Happy Weekend to you, too! Ha ha ha! Too funny! Sounds like something I might say. And my kids would totally believe it too. Great idea for a question to ask guests! Hmm, I wonder… Those little people sound familiar. I'm sure I've been told about them too! Oh those fibs adults lay on us. I think that's why when we hit our teen years we don't trust anybody over 30. Is that still the way it is? I'm basing that on kids in my family. Now I'm wondering if I told them things like Theresa's aunt did, or if I topped OldKItty's tale about the little men. Hmm. Debra – LOL! I think my kids would have believed it, too, when they were littleDeniz – I would have wanted to believe there were tiny people, too! !Kara – That's a really cute story about the trunk monster. Yep, I bet it's the writer in you! I think it's cool that your daughter wasn't afraid of it and decided it was a good monster!Lee – I can't remember if I told my kids stuff like that either. My memory isn't so good these days, but my dad was a joker and I believed everything he said! Oh, look at Theresa! What a cutie!Fun stories!!! Look how cute Theresa is!These fibs from adults and the imaginations of children are fun. That's the great thing about little kids – their big minds are so malleable. Comes in handy sometimes, like at Disney World when my then toddler had an accident in his Buzz Lightyear underpants. He had a fit when I threw them away in the little silver trash bin in the bathroom stall, so, knowing he had a matching pair back in our hotel room, I explained that the bin was for the Disney laundry service, which would clean them and send them to our room. Ten years later…I think he still believes it, haha. I can just imagine little Theresa with the cute hair and her ears close to a radio to find out if there was a man inside!And Old Kitty, your nephew sounds adorable! That reminds me of when I was a kid and I just assumed that there were people who sat around in a control center all day and changed the traffic lights from red to yellow to green. Nobody told me that, I just figured that was the only way it could happen. That was my career ambition for a while.